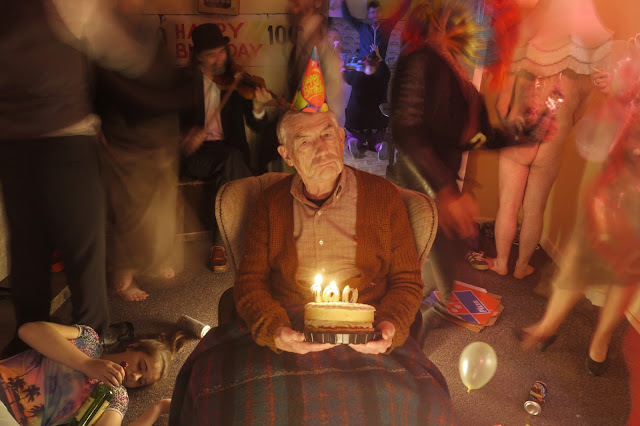 Returning to The Dublin Fringe after a sell-out run in 2012, The Gonzo Theatre Company presents The Birthday Man: a soaring new play that spans 100 years, traverses the Irish sea, and digs deep into the identity of a family that have survived against all odds. Set in three different eras, we follow one man’s life story from birth to his 100th birthday. In Dublin during the 1913 Lockout, we witness the first days of his life; in 1983 we follow him to London in the midst of the IRA bombings; and in 2013, a young couple wait for the senile old man to die. With use of dynamic multi-media & creative sound design, and an ensemble cast playing over twenty roles; this ambitious production links our desperate characters’ lives and explores themes of identity, politics, the Irish psyche, history, place, aging and temporality. Doherty weaves these complex themes into a whirlwind of time travel, hilarity, and heartbreak in this energetic, unsettling and deeply engaging theatre experience. The production is written and directed by Philip Doherty (Gonzo Theatre). Lighting design is by Mark Galione, set design is by Joseph Doherty & Annie Callaghan, multimedia is by David Reilly, costume is by Annie Callaghan, music & sound design is by Shane O’Connor, and the production is co-produced by Ciara O’Connor & Ger McNaughton. Dublin: Smock Alley Theatre, The Black Box, Dublin (7th- 15thSeptember 2013), 8pm.